I know it’s only mid-August but now is the time to start planning for some Holiday sipping and gifts with Homemade Limoncello. Yes, that’s right, I mentioned the word Holiday! This recipe is from one of my favorite chefs, Joanne Weir – it was her cooking class in Tucson that introduced me to the finer points of food, and started me on this path. Her limoncello recipe was featured in Fine Cooking magazine (March, 1997) and is still a winner today. Limoncello comes to us from the Amalfi Coast in Southern Italy and is served ice cold as an after dinner drink or aperitif. The color comes from lemon peels and the flavor is pure lemon steeped in smooth alcohol. 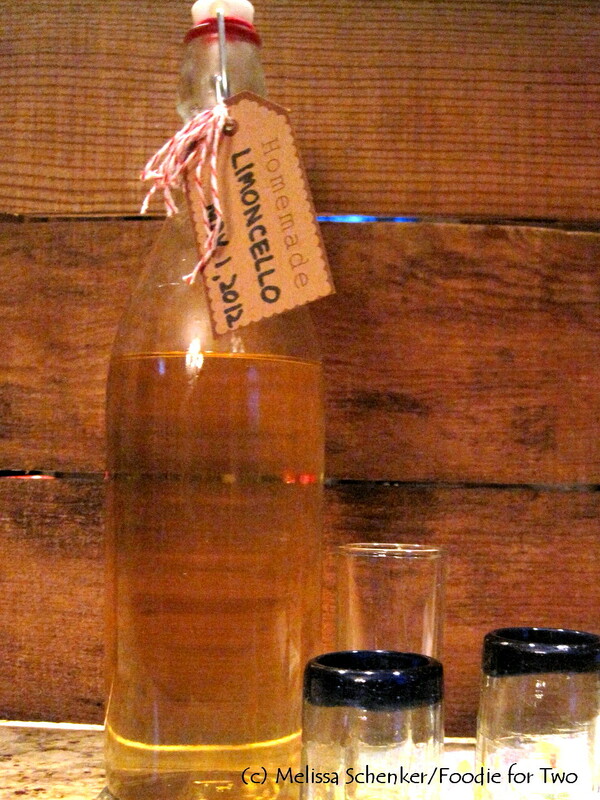 It’s a special treat to be offered a sip of someone’s homemade limoncello after a meal. Mom makes this recipe often and thankfully she shares her bounty with us, complete with handwritten labels for a personal touch. The recipe is super simple to make with only 4 ingredients: Lemon peel, good quality 100-proof vodka, sugar and water (simple syrup). But you will need to wait for 80 days to let the flavors steep, that’s why you need to plan – or at least start thinking about it – now. I will share my progress with you around the 40-day mark, and remind you that there still may be time to make a batch for the Holidays! Day 1: Wash the lemons well with a vegetable brush and hot water; pat dry. Using a vegetable peeler, remove the peel from the lemon in long, wide strips. Scrape away any of the bitter white pith from the lemon peel with a paring knife. 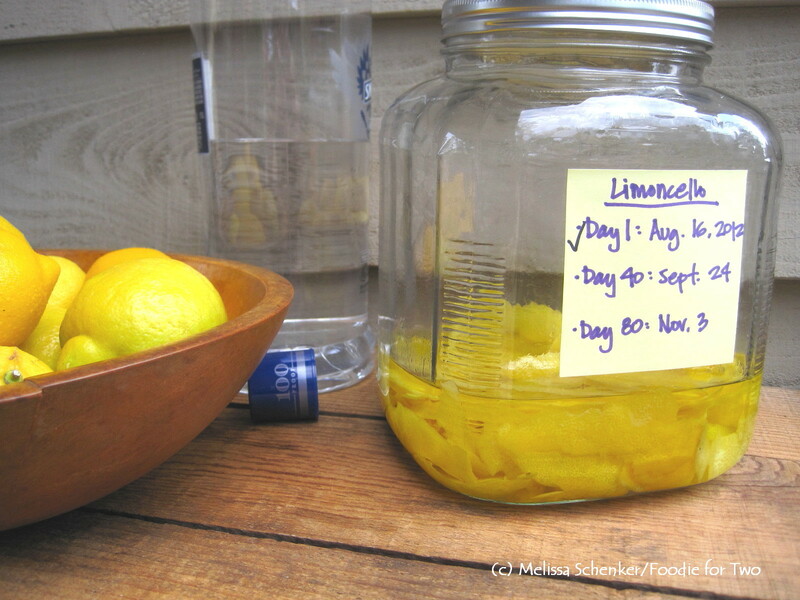 Combine the lemon peels and one of the bottles of vodka in a large (at least 4 quarts) glass jar with a lid. Cover the jar and store it at room temperature in a dark cabinet or cupboard for 40 days. As the vodka sits, it will slowly take on the bright yellow color of the lemon zest. Day 40: In a medium saucepan, combine the sugar with 5 cups of water. Bring to a boil over high heat and let the syrup boil for 5 minutes. Let the syrup cool, then add it to the limoncello mixture, along with the remaining bottle of vodka. Cover the jar and return it to the cupboard for another 40 days. Day 80: Strain the limoncello into bottles and discard the lemon zest. This entry was posted in Aperitif, Cocktail and tagged 100 Proof Vodka, Holiday Gift Idea, Joanne Weir, Julia Child PBS Re-Mix, Lemon, Limoncello, Sugar. Bookmark the permalink. Every time I watch the Julia Child video I find myself smiling the whole time and laughing out loud! I agree that Grandma has done a good job of making this a family recipe – it’s a special one. I was also so excited to see that the chef herself, Joanne Weir, read and commented on this limoncello post. Cheers! Thanks for including me! Love your blog! Wow, what a treat to receive your comment – it made my day! Thanks for stopping by. Mom and I have been enjoying your recipes (and cookbooks) since Culinary Concepts in Tucson; many are family favorites like your limoncello. Thanks for inspiring me! Enjoy your limoncello! Great video. Thanks for bringing up a bottle when you visited for Mother’s Day! Unfortunately it is all gone, every sip savored. In the video, I just love the clapping sound effects in sync with Julia Child’s knife chopping and roller pin smacking. This post came at the perfect time for 2 reasons. 1st we are having friends over for dinner and the limoncello in the freezer will be how we end the evening and 2nd, we are down to our last bottle so I need to make more! Love this Julia Child Remix! Wish I could have dined with her! Lucky you for having some limoncello tucked away in your freezer! I thought the video was so clever and refreshing……bring on the potatoes……fresh ingredients are essential……Bon Appetit!